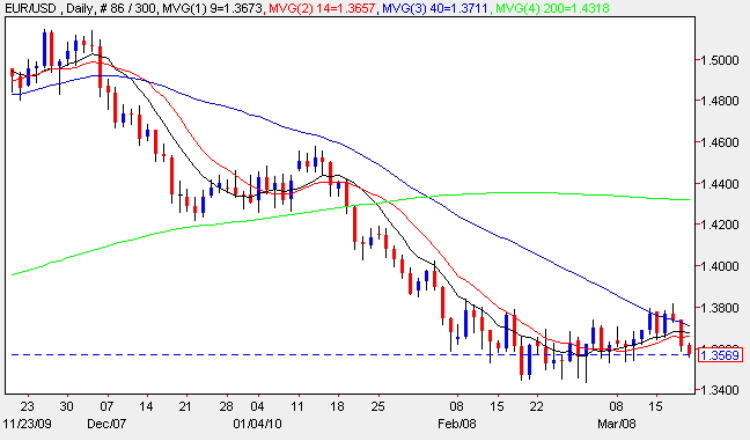 The rounded bottom pattern which was the portent for the euro’s weedy attempt to rise higher now seems to have broken down with Wednesday’s weak candle failing to breach the USD1.38 price handle and deep resistance above, with yesterday’s wide spread down candle signalling the reverse as it closed the session below all four moving averages once again. This bearish tone has now continued into the London trading session as we approach USD1.3560 at time of writing and any deeper move towards USD1.35 and below will then break below the bottom of the saucer formation signalling its demise and a continuation of the longer term bearish trend as a result. We can expect to see a break below USD1.34 early next week and should this be achieved then USD1.3 and below becomes a real possibility in the medium term, with USD1.25 a reasonable target longer term.